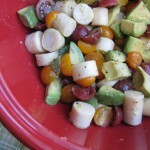 Add hearts of palm, avocados and cherry tomatoes to a large bowl. Mix lemon juice and olive oil and pour over the salad, tossing gently to combine. You can also toss in fresh chopped chives or basil or even flat leaf parsley for color and flavor. Be creative - small Persian cucumbers would be a nice addition as would edamame beans. You can scale this recipe however you like, but I recommend keeping the lemon juice and olive oil in a 1:3 ratio.